Assumption University (AU) is a private Catholic university with three campuses in the Hua Mak, Central World Plaza and Suvarnabhumi areas of Bangkok, Thailand. The university is led by the Brothers of St. Gabriel, who have been active in education in Thailand since 1901. Assumption University is noted for attracting large numbers of foreign students from countries including India, China, Myanmar, Russia, Bangladesh, Pakistan, and other Asian countries. Students from China make up the largest number of foreign students, with up to 6,000 enrolled. Approximately 1,000 Indian students also attend the university. There are exchange students from the United States (Loyola) and Europe. 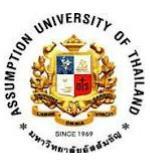 Assumption University is also the first international university in Thailand. Assumption University became an autonomous educational institution in 1969 when Assumption Commercial College (ACC) originated Assumption School of Business. In 1972 it became Assumption Business Administration College (ABAC). In 1990 the college was granted university status by the Ministry of University Affairs and took the name Assumption University (AU). Recently, AU has been expanding the Suvarnabhumi campus with Gothic-style buildings and creating a nature-centered atmosphere it calls the “University in the Park”.